^ Dry ice. britannica.com. [2019-02-01]. 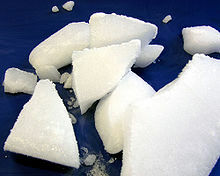 ^ Cool Uses for Dry Ice. Airgas.com. [2009-07-25]. （原始内容存档于2010-12-01）. ^ Wolcott, John. Ice-blasting firm offers a cool way to clean up. The Daily Herald. January 2008 [2008-01-20]. （原始内容存档于January 9, 2008）. ^ Thilorier. Solidification de l'Acide carbonique. Comptes rendus. 1835, 1: 194–196 （法语）. ^ Killeffer, D.H. The Growing Industry-Dry-Ice. Industrial & Engineering Chemistry (Industrial & Engineering Chemistry). October 1930, 22 (10): 1087. doi:10.1021/ie50250a022.